My family got tired of the usual bag lunch fare; so I had to do some quick thinking to find some alternatives to the regulars. So I sent this Black Bean Salad in the lunch one day and they loved it! Just popped some in a resealable plastic bag and included a spoon to eat it. No more peanut butter or plain stuff for my family :)! Here is the simple recipe: make fresh cooked beans or get a can. I usually use 2 cups of beans and save half the beans and the broth for soup or Casamiento. Sort the beans for unwanted materials like stones or discolored beans, etc. Wash thoroughly and soak in plenty of fresh water to cover. Soak for a few hours or overnight. While the beans are cooking, prepare the veggies. First peel and chop the onion finely; place in a bowl, add a pinch of salt and squeeze the lemon or lime and mix well. Peel and mince the garlic or just crush slightly and leave whole for a milder flavor. Add to the onions in the bowl. Cut off the stem of Jalapeno if using, deseed and mince finely. Cut the bell pepper in half, remove stem, seeds and pale colored membranes and dice. Wash tomato and dice. Hold the cilantro in a bunch and twist or cut off about an inch or two of the stems. Sort and wash the cilantro well and chop finely. Combine all the vegetables and herbs with the cool beans. Let the salad marinate for 15 minutes for the flavors to develop. Taste to see if more lemon or lime juice is needed. Chill until needed. Allow the salad to come to room temperature and serve cool. Enjoy! Note: Probably one can (at least 16 oz. I would think) might be equivalent to the yield from one cup of dry beans. A wonderful and succulent dish which is good hot or even at room temperature. You can vary the veggies according to the season or your preference. Children love to brown bag it for lunch in lieu of a sandwich! Just pack it in a resealable bags and include a fork! Wash all the vegetables and dry. Remove stems from eggplant, zucchini and the peppers. Peel and slice the onions. Cut them into big bite-sized pieces. Mix 2 Tbsp of the olive oil and a big pinch of salt and mix well to coat. Spread the veggies in a baking pan in a single layer and bake in a 400 degree oven for about 20 to 30 minutes or until veggies are soft and browned a little. Set aside. Wash and dry the arugula. Separate the leaves, tender stem tips, flowers and buds (yes! the flowers and buds) from the stems and discard the tough stems. Set aside. Cook the pasta according to manufacturer's directions and drain the water. Reserve about a cup of the cooking water. Heat the rest of the olive oil, stir in red pepper flakes and add garlic and stir for about 30 seconds. Sprinkle the torn or chopped herbs; use just parsley or add a little of the other ones too according to your taste. Try just a little of the strongly flavored herbs such as marjoram and sage until you find your own special combination. Stir in the arugula one handful at a time to wilt. Add the hot pasta, the salt and pepper, the roasted veggies, and as much of the reserved cooking fluid as you wish to make it moist. Stir well to combine. Serve hot with lemon wedges,the grated Parmesan cheese, and more freshly ground black pepper if you wish. Note: Stir fried Tofu slices or a cup of Canellini or Red Kidney Beans make a great addition to this pasta dish. Rapini (looks like leafy broccoli - mostly leafy), broccoli, kale, spinach or green cabbage can be substituted for the arugula. Do try arugula at least once; it loses its bite and becomes very mellow when cooked. Shakkara Pongal is made as 'neyvedyam' or a divine offering on the day of Pongal or Makara Sankranthi as well as other special occasions. Makara Sankranthi is the day, I believe, when Winter Solstice occurs. The sweet pongal is made with Shakkarai or Vellum (in Tamil), the Indian brown sugar named 'jaggery' (Gur in Hindi). Pongal means 'boiling over' (it is equivalent to the phrase in English 'the cup runneth over') to denote abundance. Do use Jaggery/Gur if you can since it has a wonderful flavor but the regular brown cane sugar will suffice in a pinch. Cardamom pods, Jaggery/Gur, Mung Dal, Ghee, etc are readily available in Indian grocery stores. Any type of rice such as Basmati, Patna, Jasmine rice, etc. will work; but par-boiled rice is not traditionally used for making any type of sweet rice dishes. Roast the dal in a dry skillet stirring constantly until lightly browned and fragrant. Or spread in a baking pan and toast in a 350 degree oven for 10 minutes. Let cool. Wash the rice and roasted dal in several changes of water and place in a large pan with 2 cups of water and the milk. Bring to a boil and cook stirring occasionally until soft. Stir in the jaggery or brown sugar and 2 Tablespoons of Ghee or butter and cook stirring until thickened. Although the pongal will get a little watery when sugar is added at first, it will thicken with cooking. When thick, turn off heat. Crush the cardamom pods slightly and gather the seeds inside. Discard the empty pods. Crush the cardamom seeds finely using a mortar and pestle. Add a few gratings of nutmeg if using, to the ground cardamom and set aside. Sprinkle with ground spices over the shakkara pongal. Heat 2 Tbsp of the Ghee or unsalted butter in a small skillet and cook the cashew pieces until golden. Stir in the raisins and cook until raisins plump up. Turn off the heat, remove the nuts and raisins with a slotted spoon and set aside. In the same skillet cook the coconut in the remaining ghee or butter until golden and pour over the pongal. Add the nuts and raisins and stir well to combine and serve hot, warm or at room temperature but never cold. Variations: Although the traditional pongal is prepared with mung dal, Chana Dal makes a welcome substitution. At our home a practically dal-less and milk-less version was prepared. To satisfy tradition, just a couple of drops of milk and a few grains of the dal (untoasted since it is such a small quantity) were added to the rice. Adding at least a tiny pinch of dal is considered auspicious. Our Thathi (grandmother) and Amma usually left out the cardamom, nuts and raisins also. Instead they added a liberal amount of browned coconut and spiced it with a little freshly ground dry ginger. Frijoles Mexicanas or just plain melt in your mouth pinto beans are so satisfying! It is an amazingly simple dish and people don't often believe that there is not a drop of oil or butter in it. I learned to cook pintos from my friend Pat a loooong time ago and she used to put a little butter at the end. I used to put a tiny bit of olive oil instead for its health benefits until I saw that Anna doesn't add any fat at all. So now I don't add any either. 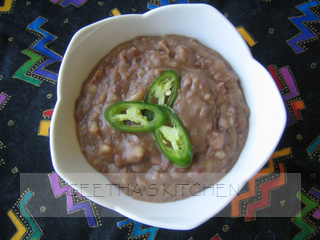 Amma loved this pinto bean dish and would say, "I will make the salsa if you make the beans". Children of all ages (ours and their friends) love to make their own tacos, tostados, nachos, or burritos with Frijoles! Sort the beans for rocks or other debris. Wash thoroughly and soak in plenty of fresh water to cover overnight. Drain, rinse and place the beans in a large, heavy stainless steel pot with the whole dry red or green chili. Cover the beans with fresh water about one inch above the beans. Bring to a boil and lower the heat to simmer. Let cook for about 45 minutes or until very soft and creamy. Even the broth should start to become creamy. Add salt and simmer for 10 to 15 more minutes stirring occasionally to prevent scorching. Remove from heat, fish out the chili and discard. Mash the beans a little (or a lot) if you wish. I like texture so choose to mash a little. If you like spicy Frijoles, stir in the spice mix along with the salt and proceed as described above. Serve hot with your favorite tortillas and toppings. The beans can also be cooked in a pressure cooker to shorten cooking time by about 1/3; proceed according to manufacturer's directions. Our family loves these beans with warm corn or whole wheat tortillas (or roti/chapatis - Indian bread just like tortillas), Cashew/Tofu sour cream, grated cheese, shredded romaine lettuce and any one of the fresh salsas such as Salsa I or Salsa II or Avocado Salsa. Other dishes that go well with Frijoles are Cilantro Rice or Salsa Rice. If one wishes to have a less calorie dense meal, it is easy to forgo the tortillas and just layer all the other ingredients in a bowl or on a plate for "bare" tostadas or burritos or use large romaine leaves instead to make tacos :)! This salsa is based on Anna's salsa; Anna's family originally came from Mexico. Apparently her parents devised this salsa to get some much needed veggies into their children's diet by pulverizing the tomatoes so that...........look Ma, no chunks :)! and it worked! I have adapted it just a little to suit my family's tastes by adding the chile and red onion instead of the white! It is not only easy to make, but very good tasting too! Wash the vegetables well. Remove stem ends from the tomato and cut into quarters. Remove stem, seeds and membranes from the chile for a mild salsa. Leave the chilies whole if you like your salsa spicy. Cook covered in a microwave proof bowl for about 7 minutes or until cooked. Alternately cook in a pan with a few tablespoons of water until cooked. Set aside to cool. Mix the chopped onions with the lime juice, salt and pepper. Let marinate while you are preparing the tomatoes (about 10 minutes or so). Blend or pulverize the tomatoes and chile to your desired consistency and mix with the marinated onions. Chill until ready to eat. This salsa lasts for a few days in the fridge. Some chopped fresh cilantro can be stirred in also. Enjoy with pinto beans, rice, chips, quesadilla, omelets, Veggie Chili, Frijoles, etc. I absolutely adore avocados. It was not love at first sight though. Paji introduced me to the first avocado and told me that I would love it! He told me to just cut it in half and eat it. Well, needless to say that I did not love that one. Subsequently though, I learned to eat it in many different ways - actually even just cut in half, but with the addition of salt and pepper - and did fall hopelessly in love :)! With all the wonderful nutrients in it, I feel it should be - an avocado a day keeps the doctor away - instead of the proverbial apple. Well, if not daily, I try to get some once or twice a week at least. Here is an easy way to get some anytime you feel like it. Mexican food is so much like Indian food to me because of the ingredients like beans, rice, tortillas and last but not least, the fantastic salsa! My family just eats it up when we have beans and salsa. The only time consuming thing is all the chopping for the salsa. So instead of making Guacamole and salsa, I combined the two to make avocado salsa. Our family loves it. Perhaps you might like it too. Wash and dry the tomatoes, chili and cilantro. Chop all finely and place in a bowl with salt to taste. Peel the onion and chop finely. Combine the onions with the tomato mixture. Cut the avocado in half. Remove the pit and reserve. Carefully cut the avocado while in its skin by drawing the knife first lengthwise and then crosswise without cutting through the skin. Scoop out of the skin with a spoon into the tomato mixture. Squeeze the lime juice over the avocados and stir gently to mix well. Serve right away or place the pit snuggled in the salsa, cover with plastic film and chill until ready to serve. Apparently the pit prevents oxidation - the turning brown of the avocado; remove it before serving or leave it as a garnish! This salsa is best when used within a couple of hours. Serve with Frijoles Mexicanas, quesadillas, or chips. Enjoy!! Here is another (perhaps the grown-up) version of the salsa Mexicana. It is very much like the "salaad" that Amma used to make to eat with rice pulav with the exception of the broiled chilies. It is absolutely delicious and once you try it, I am sure you will find it indispensable and find many uses for it: with quesadillas, grilled cheese or other sandwiches, beans and rice, chips, etc, etc. And it has only FIVE ingredients:)! Oops forgot the garlic; so now there are six. If you like the taste of broiled/roasted chilies but not so much the heat, Pasilla/Poblano chilies or Anaheim/California chilies may be used instead of the hot ones. Enjoy! Grill or oven/flame broil chilies until slightly charred on all sides. Put them in a brown bag while still hot and close the bag tightly and let chilies sweat and cool. Use rubber gloves for the next step. When cool enough to handle, remove the skins from the chilies carefully. Discard the stem, seeds and membranes and chop fine. Place in a bowl. Wash well and dry the tomatoes and cilantro. Peel the onion and rinse. Chop all finely and mix with the chilies and salt to taste. Peel the garlic, mince finely, and add to the salsa. Let sit for 15 minutes for the flavors to meld and develop. Serve cold or at room temperature. Alternately, instead of chopping all the veggies, they can be pureed in a blender or food processor to desired consistency. Include the seeds and membranes of the chilies if you would like a spicier salsa and/or use more chilies. Our family loves these quesadillas. This is the way we used to make sandwiches with or without the cheese. I love that they have lots of flavorful veggies in addition to the tortillas and cheese to make a more complete meal. You can also use any kind of bread slices to make a grilled cheese sandwich the same way. Very quick and delicious! Makes 4. Wash all the veggies well and chop finely. Mix with the salt. This amount is enough for 4 quesadillas or sandwiches. Heat a skillet or griddle. Divide the veggie mixture among 4 tortillas or bread slices and spread. Sprinkle with one oz. of cheese on top of each. Cover with another piece of bread or tortilla. Carefully place on the hot skillet/griddle, cover and cook on both sides until the cheese melts. Remove from heat and put on a plate. Cut into 4 wedges with a knife or a pizza slicer. Serve with Salsa I or Salsa II or Avocado Salsa. It is to live for :)! For a more substantial meal serve with Simple Pinto Beans and a salad if you wish. I came up with this innovation when we were sick with a bad cold. Not only did my family need a soothing bowl of Rasam Rice, I badly needed one too. So dire necessity inspired the invention of One Pot Rasam Rice and all of it disappeared in record time! The cumin and black pepper (in the rasam spices) are said to be the perfect antidotes for cold and cough. Rasam and rasam rice are India's answers to bring comfort when one is afflicted with cold, flu, or feeling out of sorts! The hot, brothy, and easy to digest rasam is hydrating and nourishing while the warm spices help to thin the mucus and clear the sinuses and lungs. We adore rasam and rasam rice so much, we don't wait for cold & flu season to make them. Rasam is a wonderful starter and also can make a light meal with freshly cooked rice and any simple veggie dish like Thoran, Mezhukuvarati, Upperi, "Fry", etc. I use short or long grain brown rice and toor, masoor dal or sometimes a combination of half masoor and half toor dal. This is a great recipe to make ahead; it is great for busy weeknights. Rasam rice freezes well also. If fresh tomatoes are not great, canned or simply dried tomatoes (not marinated) work well. If you don't have the homemade Rasam Powder, it is a spice mix and is readily available at Indian grocery stores. Masoor and Toor dals are available in Indian or other markets. Masoor dal is often called Red or Pink Lentils and cooks very quickly even without soaking. Sort the dal for stones or other debris. Wash the rice and dal in two or three changes of fresh water. Let them soak in plenty of fresh water to cover for 30 minutes. Drain and rinse. Bring 6 cups of water to boil and add the rice and dal with the turmeric and salt. Bring to a boil again and reduce the heat to simmer. Cook for about 30 minutes stirring often all the way to the bottom to prevent sticking or burning. The rice and dal maybe cooked in a pressure or slow cooker according to manufacturer's directions. Stir in the Rasam Powder and the chopped tomatoes and cook until tomatoes are soft and practically melt into the rice mixture, about 10 minutes. At this point the rice/dal mixture should be creamy and well cooked. Add more boiling water if a thinner consistency is desired. Turn off heat, place the curry leaves on top and cover. Heat the oil in a small pan to make tadka. Add mustard and cumin seeds and cover. When the spices finish dancing, quickly add asafoetida. Stir to mix and pour carefully over the curry leaves into the rasam rice being careful to avoid splashing the hot oil. The meeting of moist curry leaves and the hot oil is generally an exciting event; so be cautious. Stir in cilantro leaves and the lime juice and serve hot in wide soup bowls. Rasam rice delicious by itself or served with simple vegetables and roasted papadams.